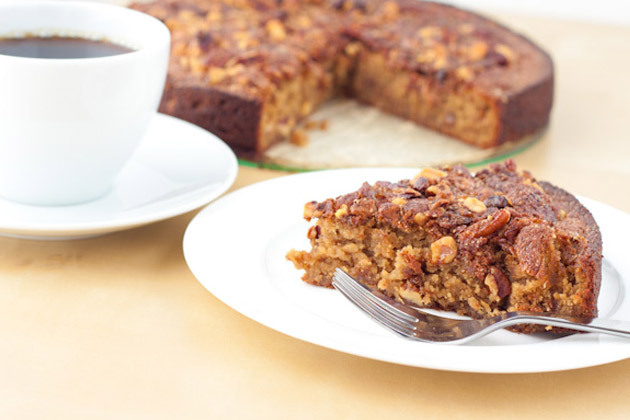 An extremely moist and delicious grain-free coffee cake made with love. Preheat oven to 170F and place rack in center of oven. 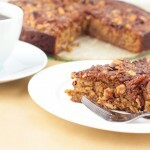 Place the coffee cake topping nuts on a baking sheet and bake for 40 minutes or until fragrant and lightly brown. Let cool and then coarsely chop. Set aside. In a small bowl, stir together the coconut sugar, roasted nuts, ground cinnamon and flour. Set aside. Oil a 9-inch spring form pan with a dab of coconut oil. Line the bottom of the pan with a circle of parchment paper. In a separate bowl whisk together the flour, baking powder, baking soda, and salt. Set aside. In a food processor or blender, combine the milk, date, and cashews and blend until smooth. Set aside. In the bowl of your electric mixer (or with a hand mixer), beat the coconut oil until softened (about 30 seconds). Add the sugar and continue to beat until light and fluffy (about 3 minutes). Add the eggs, one at a time, beating well after each addition. Beat in the vanilla extract. With the mixer on low, add the flour mixture and milk mixture. Mix only until combined. Spoon half of the batter into the prepared pan, smoothing the top with a spatula. Sprinkle about half of the nut topping on top of the batter. Cover with the remaining batter and then sprinkle with the remaining nut topping. Bake for about 30- 40 minutes (mine took 40 but was a bit crispy and burned at the edges), or until a toothpick inserted into the middle of the cake comes out clean. Remove from the oven and let rest for about 10 minutes before releasing the sides of the pan.